Is i += f(++i); undefined behavior in C++? You need to use jQuery.click() on the checkbox. Also with some regularity, these "answers" often get flagged as Not An Answer. Sometimes this works, and the answers get deleted in the Low Quality Posts review queue (or by a ♦ mod going above and beyond their duty), but more often than not, such flags get declined with a terse message that "a moderator reviewed your flag, but found no evidence to support it", or perhaps that "flags should not be used to indicate technical inaccuracies, or an altogether wrong answer". Sanity check on NAA flag? Why was my last flag declined? Does answering the wrong question make an answer not an answer? Is this really an answer? Why was my "not an answer" flag declined as having no evidence? For a few examples, see these highly upvoted comments. The problem is that, even though it has been clearly explained on Meta several times that mods do not (automatically) see the question when going through NAA flags, and will therefore tend to reject any flags for answers the look like they're answering some question, this is not obvious from the flag description at all. Since most users will never see those Meta posts unless they're pointed to them, there will always be people flagging answers as NAA because they answer some other question than what was asked. That is, unless we change the flag description. There have been extensive proposals for overhauling the NAA flags before, but I'd like to propose just a very simple, almost trivial change: replace "the question" with "a question" (and maybe "does not attempt" with "does not look like an attempt"). This was posted as an answer, but it does not look like an attempt to answer a question. It should possibly be an edit, a comment, another question, or deleted altogether. This should bring the flag description much better in line with how NAA flags are actually being handled by mods. We have a lot of flaggers, and the experienced ones among them will still know that it qualifies. It's probably better for the less experienced ones to flag slightly too little than too much. If it's obvious that the answer doesn't belong here (as should be the case for real NAA flags), most users will find some way of reporting it. They might occasionally end up flagging such answers as VLQ, or as "other", but that has little effect on the eventual outcome. If someone is entirely deterred from flagging a non-answer because of this change, and even if no-one else comes along to flag it, it will still likely get downvoted (or at least will not get upvoted), pushing it below actual answers. If it doesn't get flagged or downvoted at all, that probably means that the whole thread is tumbleweed territory, anyway (and likely to be eventually cleaned away by the roomba). In the end, it's just a few words in an obscure dialog that most SO users will never even see. But I think this change would save a few of those users some frustration and headache, and save us from having to re-hash this issue on Meta quite so often. When you start an animation, you need to let control return back to the system in order to see it perform the animation. Inserting a sleep is almost never the right thing to do in today's world of multi-threaded systems. It is certainly the reason that you are experiencing this issue. You'll also need to instantiate the object and actually add the animation to the layer. I think you're overstating the severity of the problem here. ...and that first option is the one that should be used to decline most flags that concern an incorrect - but otherwise well-formed - answer. It's not always enough to read the question, it's not even enough to understand the question - to correctly evaluate these answers, you need a solid understanding of the answer and the ability to judge whether or not it might actually solve the underlying problem. Whether a moderator or reviewer is able to do this is impossible to predict. ...and even if the person handling the flag does understand the technologies involved, this can all fall apart if the question itself is unclear. At least one of your examples involved a lousy answer to a terrible question - in this situation, all bets are off; realistically, the moderator is probably better off closing or deleting the question and ignoring the flagged answer. So the problem here isn't so much that moderators can't or won't handle blatantly off-topic answers, it's that the cases where they don't are usually a lot less clear-cut than the flagger realizes. That's why we have decline reasons, and why we notify flaggers of declined flags - so that they can develop a better understanding of how these things are perceived and learn to use the system more effectively. In other words, these discussions aren't so much an indication of a serious problem as they are the results of an educational tool that was long overdue. The volume of these complaints are a drop in the bucket compared to the number of flags declined, the volume of which is similarly minuscule when compared to those that are acted on or even those which are disputed. I'm reticent to make any changes here that would discourage people from flagging truly egregious violations: folks posting the first Google result without any indication that it relates to the question whatsoever, auto-generated spam, etc. Such answers are a disease, and not one that should be ignored. If that means the occasional dispute over an edge-case, so be it - there are literally thousands of success stories to go with every one of them, and each small success makes reading Stack Overflow a better experience than the forums that don't bother going after these. this answer appears to address the asker's problem. Use downvotes to indicate inaccurate or entirely wrong answers. For subtle forms of abuse, choose "other" and explain the problem in detail. I think the combination of these two changes would serve to reduce a lot of the confusion surrounding these flags, without greatly changing the implied purpose. I think this is a great idea, in principle. It really gets my goat up when people cling stubbornly to their misconception of the flag so, if we can make it easier for them to understand then we'll all be better off for it. This was posted as an answer, but instead it discusses the question, asks a follow-up question, suggests an edit, or is otherwise misplaced. It should have been written as a comment; in its current form, it could be deleted. Use "any" instead of "a". This will put greater emphasis on the meaning you're trying to convey. Do away with the "deleted altogether" part. The more I think about it, the more it seems way too broad. It's more likely to lead to incorrect usage of the flag than it is to provide any clarity. There's a lot of content that should be deleted but doesn't qualify for the flag. This was posted as an answer, but it does not attempt to provide any answer to any question. It possibly should be an edit, a comment, or another question, or it may be off-topic for the site. Attempts to communicate with another user. Using the answer space to ask a question. The OP posting an answer to clarify their question or add additional detail. Attempts to bump the question as in "I'm having the same problem." "Thanks," I like turtles, and similar noise. 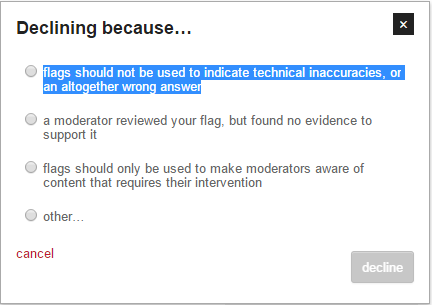 Pro Tip: Mods do not look at the question when moderating "Not an Answer" flags. If your flag requires a mod to evaluate an answer from the question's perspective, do not use a "Not an Answer" flag on it. My question here is simple: how on earth are mods supposed to know whether something might be a valid answer without knowing what the question is? I think the best thing that could be done to make NAA flagging work better is to make it clear to mods that they need to read the question. If that means rewording the flag description to say "does not attempt to answer this question" or something like that, then I'm all for it. If anyone has ideas for on how it could be achieved by other means, then those are probably worth looking at too. I fail to see how this answer addresses the question’s problem in any way. Also, this way authors of such answers get informed early and can either clarify how their answer relates to the question (if it actually does) or delete it (if they realise that they made a mistake) – not that I expect this to work very often. This answer is bascially spam but doesn't promote anything. It wouldn't meet answer standards anywhere on the site. So this doesn't overlap with VLQ. VLQ goes out to non-mods in the area, to spread awareness and potentially solicit delete votes about misleading erroneousness or other fine grained content problems. The VLQ queue could potentially be improved by being fed to people participating in the relevant tags. Conclusion: junk is just for the trash that isn't spam. Then I think everything is accounted for. Not the answer you're looking for? Browse other questions tagged feature-request flags not-an-answer . Why are we supposed to let incorrect answers stick around? Should the “Not an answer” flag be split in two?